This dark tale of obsession, beauty, and lust is by Wall Street Journal, USA Today, and Amazon Bestseller Vivian Wood. She writes dark romance as OLIVIA RYANN. I wake up in the wreckage, ready to fight for Rue. Only she is gone, stolen away by my archenemy. I start to see red. No one touches my girl and expects to live. The deck is stacked against us. Emotions are running high. There is one thing that no one else realizes, though. Rue is mine, and I will get her back if it is the last f*cking thing I do. 5.0 out of 5 starsMy Favourite! This is the epic ending to this series! I could not wait to get my hands on this book. The storyline has been one of the most intriguing storyline that have read in a long time. I just loved every minute of reading this book. I loved the way that Rue Grew in this book. She started the series as a timid young woman, and ended the series as a strong woman that stands up for herself and will never let herself be anybody’s doormat. I can see it change Dryas. He change so much in this book, it was a delight to see such a strong man falling in love. I’m sad to see the series end but I know that there will be many other wonderful stories coming our way from this author. I just enjoyed reading this book and I hope you do too. 5.0 out of 5 starsGreat Series !! What an ending to a great series. We finally get the answers in this book after a few twist and turns. I received a free copy of this book for a voluntarily review. 5.0 out of 5 starsSo much love. 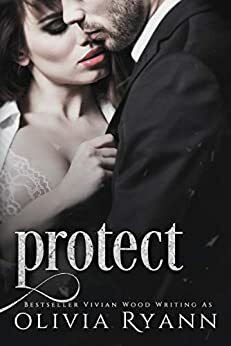 Please remember this is the fourth, and final book in the Protect series. Provoke, Punish, Possess, Protect. I absolutely loved Dryas' and Rue's story, and adored them every step of the way. Well, most every step. There are points where you kind of had to have a love/hate relationship with Dryas. This series has been brilliant with every word, and I'm glad I was able to take the journey with them. This was such an amazing ending to their story. I loved everything about it. The action, drama, feels, heat and just the pure emotion of it all. It's a non stop ride, that you don't want to get off. I love this entire series and totally recommend it. P.S. What happened to Father Derrick is completely priceless. P.S.S. I so, so want more of Damen. So much more. I have been dying in anticipation for the conclusion to Dryas and Rue's chaotically enticing tale of lust, love, confusion, redemption, and pain. Their messy, heartbreaking spine-tingling romance of the dark side has had me in its clutches since the very beginning - With 'Protect' -Olivia Ryann did not disappoint! Watching the pieces come together, the only way Dryas and Rue knew how, with the helpful nudge of his brother Damien, their rock the boat journey to HEA territory is better than I could have ever imagined! Giving new lives, along with vivid images to the strong-willed larger than life- front and center characters and smiles to my face at the ending of a deliciously dark, and twisted set of books! I cannot wait to see what Olivia Ryann has in store for us next! 5.0 out of 5 starsOMG !!! Absolutely stunning!! I was completely captivated by Dryas and Rue’s journey. Secrets, lies, danger, death, suspense, and action that filled this book with an amazing adventure. So intriguing that I couldn’t put it down until I finished the last word. Olivia Ryann / Vivian Wood outdid herself in her writing of this story. I definitely recommend it to anyone looking for an amazing read. 5.0 out of 5 starsWhat an ending!! WOW! That is all I can say. The final installment of this series was the kind of story that you can not put down. Dryas and Rue have an unlikely love story. I found it fitting that he must save her again at the end. Rue endured a lot in these books but Dryas grew so much that it offset the bad. He truly became a hero. Now I am waiting for the final brother to get his own story told...please Olivia, give us some more Damen and Bianka!! !